"Ardent and Loyal Warrior 笃烈之士 (dǔ liè zhī shì)"
One of the early generals before the Three Kingdoms were formed, Taishi Ci was one of Sun Ce 孙策's most capable generals. A man with a criminal past, Taishi Ci was denied higher positions and responsibilities by his previous leader Liu Yao 刘繇. 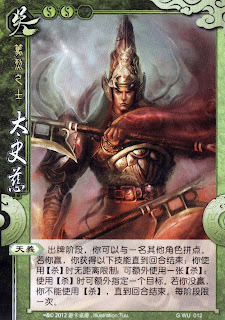 In one instance, Taishi Ci battled Sun Ce and were equally matched. This gave Sun Ce respect for Taishi Ci. When Sun Ce eventually defeated Liu Yao, Sun Ce promised Taishi Ci acknowledgement of his capabilities with important positions. Taishi Ci accepted and thus became a loyal and capable general under the Kingdom of Sun Wu 孙吴 till his death. Character ability: "Justice of Heaven 天义 (tiān yì)"
During your action phase, you can conduct a Points Duel with another player. If you win, you acquire all of the following until the end of your turn. 3. You can target one additional player when you use ATTACK. If you lose, you cannot use ATTACK till the end of the turn. Limited to once per phase. There does not seem to be much relation to the story, though there is some history to how this ability came about. Before the Fire Expansion Pack 火包 was released by Yoka Games, people have already created their own Tai Shi Ci character which allowed him to equip two weapons simultaneously. I guess Yoka Games took note of that and modified it into the ability we see today.